Is Dame Judi Dench a Big Awards Threat in Crowd Pleaser 'Philomena'? It won't shock anyone to say that Judi Dench is considered a favorite of the Academy. A half-dozen Oscar nominations later (including a win for her Supporting turn in Shakespeare in Love), pretty much anything that Dench involves herself in is given a feeling of prestige and looked at as something in the running for awards. Hell, remember last year when Dench was rumored to be on the cusp of an Oscar nod for Skyfall? Academy members love them some Dench. At the same time though, she hasn't had a nom in over a half decade (a Best Actress citation for Notes on a Scandal), so this year, many voters are surely thrilled that Dench is back in play with Philomena, which opens on Friday. But is she a likely nominee? 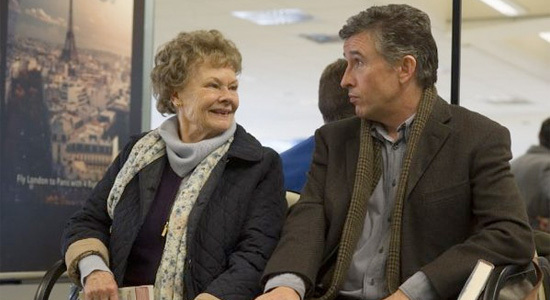 Stephen Frears' new film certainly is gunning for some nominations (backed by Harvey Weinstein), so it's well worth discussing if Dench and Philomena itself is going to be a factor in 2013, and if so to what degree? If you look at the roles that Oscar has embraced Dench for in the past, you can see that they don't have one specific box in which to pigeonhole her. They've nominated her for comedy and drama, period and modern, royal and common. That both makes her a likelier nominee for Philomena, which is about as crowd pleasing a picture as she's ever been involved in, but also takes away the narrative that this dramedy represents any kind of a change of pace for her. The lack of that hurts her somewhat, but it doesn't remove her from the top tier of the Best Actress race at all. Who exactly is Dench competing with at this point in the season? Well, it's really between her, Cate Blanchett for Blue Jasmine, Sandra Bullock for Gravity, Adèle Exarchopoulos for Blue is the Warmest Color, Meryl Streep for August: Osage County, Emma Thompson for Saving Mr. Banks, and Kate Winslet for Labor Day. It's a tough field, and right now the only locks are Blanchett and Bullock (though Thompson seems more and more likely as the days pass). Put Dench up against Exarchopoulos, Streep, and Winslet though, and you have to feel decently good about her odds. If she can get in, she could even become a dark horse to win, though I wouldn't bet on that one at all. This category seems to be Blanchett's for the taking still. If there's a benefit to Philomena's candidacy on the whole, it's how easy the film itself goes down. The movie is a crowd pleaser that has moments of broad comedy as well as touching drama. Dench interacts well with co-star/the co-writer of the flick Steve Coogan, and it's hard not to leave the picture feeling good. It's far from a perfect film, but it's definitely easy enough to embrace, which helps on all fronts. Personally, I don't think it's anything better than just good, but when has that ever stopped a likable flick from getting some Oscar love in the past? It's currently sitting around 90% positive on Rotten Tomatoes, so there's no shortage of critics that are more in love with it than I am. So where could Philomena ultimately play, Oscar wise? Since it's The Weinstein Company handling things, they're certainly gunning for as much as possible. There will be campaigns for Best Picture, Best Director for Frears, Best Supporting Actor for Coogan, Best Actress for Dench, as well as Best Adapted Screenplay for Coogan and Jeff Pope. TWC is obviously going to push hard for Best Actress and Adapted Screenplay, so that's where their best bets are. That being said, it could be a sleeper Best Picture nominee, especially with no other Weinstein flicks seeming like obvious nominees at this juncture. As long as Philomena doesn't get lost in the November/December Oscar season shuffle, you should expect it to do very well in terms of the precursors, which will likely lead to a nod or two from the Academy. Dench obviously is the high profile nom, but Adapted Screenplay could wind up being the only one to bank on, depending on what happens. As it stands now, this is one of the few crowd pleasers in the race, so never underestimate that factor. It's not going to become this year's Silver Linings Playbook, but I doubt it's going to be totally forgotten by voters either. Right now it seems to be between her and Blanchett, with Thompson as the dark horse. However, the crowd-pleasing nature of her film could certainly give her the edge, and as you say, the Academy does love her. I'll be interested to see how this one pans out. This seems like the least interesting performance in the running, but what do I know? It's a bit more mainstream at least, yes. I hope Cate wins, but you never know when the Weinsteins are in the mix. She is always so professional, i.e. terrific. Has she ever been challenged by a role? I do not think so. At least not in the last decade or two. She does have a comfort zone, yes...but she's hardly the only one. That reveal of Darth Vader in return of the Jedi! Oh That's Judy Dench! Do you see that joke? Oh that's right it went way over your head! No, I got it, trust me. Oh yeah that's right you elitists are "above" humor! How is he an elitist? Sounds like she could be in.